DISCLAIMER: If you are an experienced Italian chef, or have traveled Italy extensively, or (just to be safe) if you are a part Italian, it’s probably best if you do not read the following post, lest you lose all faith in me. Last night I was writing a grocery list while standing in front of the list of 30 Before 30 list taped on our fridge. I have fallen slightly behind, so I wanted to buy ingredients for several dishes. One of those dishes being polenta. I had a basic idea of what polenta was and I’ve eaten it once. Strangely enough, I do feel like it shows up on “Molto Mario” or even “Top Chef” more often than it shows up on the average menu in flyover country . Hence, my knowledge is limited. That being said, I couldn’t find polenta at the grocery store. I looked in the Italian section. Nothing. Then I looked by the grains and flours. Nothing. I even asked the assistant manager where it was, saying, “Polenta….it’s like cornmeal”. Not only is polenta “like cornmeal” , um, it IS cornmeal. Riiiiiight. Teachable moment: do your research. 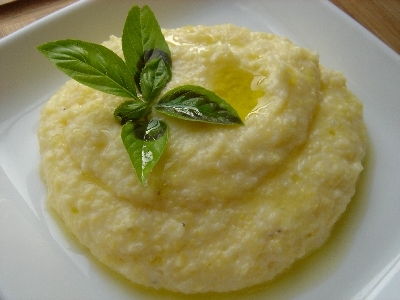 Polenta is made from cooking cornmeal slowly with liquid until it becomes creamy. It is very clear from even this (questionable) source and is pretty damn obvious from a cursory glance at this basic recipe. (Shakes head). Seriously. I bet even the “Jersey Shore” kids know how to make polenta. Ok, now I’m being hard on myself. SO: The good news is that I already have all the ingredients, so I can make polenta without further embarrassment (I hope). The bad news is that I didn’t even make it 6 months on this blog without a Jersey Shore reference.